I was collecting bottle caps for some yet to be determined use when I started to think about going “back to school”. Visions of reading, science, social studies, and math danced inside my brain. Then this activity danced right in and took a bow. 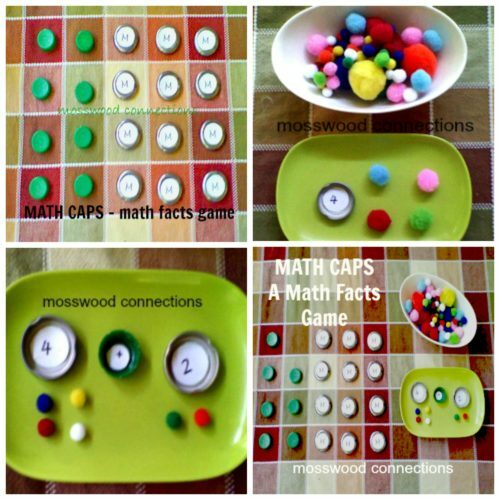 I tried it out and realized that I had a winner – a fun way to practice math facts using recycled materials. Either cut out circles with numerals 1-9 and +, -, X written on the circles or use a permanent marker to write the numbers and equation signs inside the bottle caps. I had the kids help cut out and glue to add in fine motor skills and to keep them involved. Lay the bottle caps with numerals on a surface with the numerals hidden. Choose a cap. Take as many pom poms (or whatever item you have; beans, rocks, etc.) to match the number you chose. The same as Game 1 but this time make it a multi-player game. Play that whoever chooses the numeral that gives you more wins that number of items. Switch it around and have the person who chooses the number that gives you fewer items wins. For this game, first, choose an equation bottle cap. For beginners, start with addition and add in subtraction and multiplication as skills are acquired. Then choose 2 numeral bottle caps. The other player does the same. Whoever has the highest sum or product wins that many pom poms or if you don’t have small items to win then they would win a point. You could also use this as a number memory game. 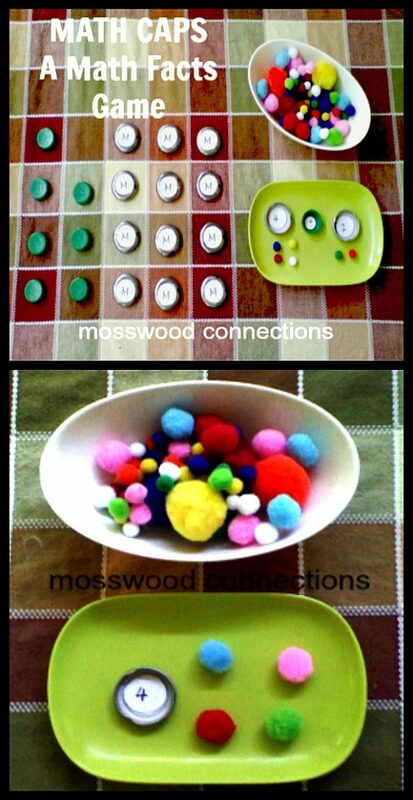 Simply make two of each numeral and play a memory matching game. Use larger bottle caps. Write an equation in one cap and the corresponding number on another cap. Play a memory matching game. Math Fact Practice – Multiplayer Games – Math with Friends!